As their official mouthguard provider, OPRO will supply elite level mouthguards to the men’s and women’s senior squads, as well as reserves and junior teams. 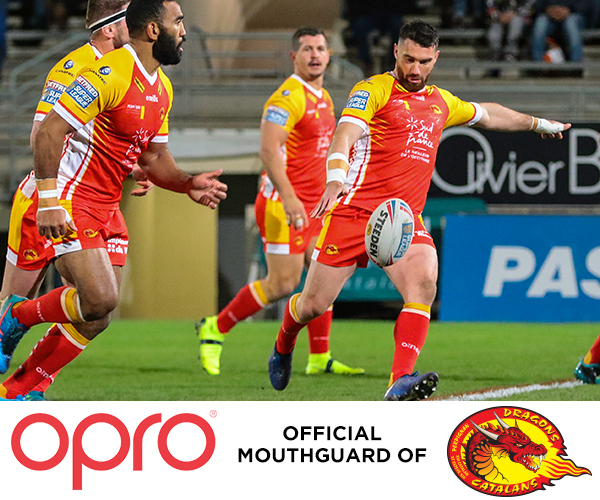 With this new partnership, OPRO are now the official mouthguard partner of nine of the 12 Super League teams, in addition to England Rugby League, who oversee the sport of rugby league in England. With the new season underway as of last week, OPRO CEO David Allen commented: “We’re delighted to be the official mouthguard provider to such a decorated list of teams that compete in the Super League. As last year’s Challenge Cup winners, the Catalans Dragons are a fantastic team to be working with. Rob Parkinson, Head of Medical Services said: “The Catalans Dragons are extremely happy to have started a partnership with OPRO, their reputation for excellent product quality and customer care made it an easy choice. In a sport as physical as rugby league it was essential for us to find a close fitting and well-designed guard for our players to wear for games and training. We have that with OPRO." OPRO have longstanding partnerships with over 50 world class sporting associations, including the likes of England Rugby, New Zealand Rugby, Australia Rugby, England Boxing, and the Ultimate Fighting Championship (UFC). OPRO is the official mouthguard partner of a number of professional sporting organisations, including England Rugby, New Zealand Rugby, Australia Rugby, 11 Gallagher Premiership Rugby teams, the Ultimate Fighting Championship (UFC), GB Taekwondo, England Hockey, England Boxing, the Gaelic Athletic Association (GAA), and the German, French, Italian, Cameroonian and Northern Ireland Mixed Martial Arts Federations.